Easter. Annual CND march over four days from Aldermaston to London. 450 local CND groups nationwide. 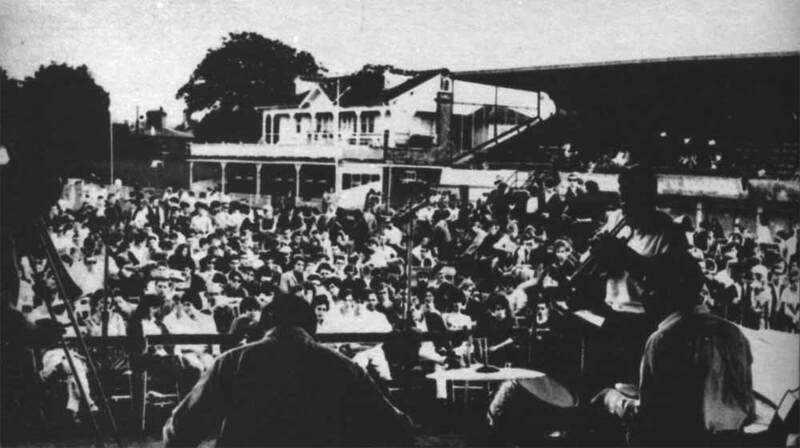 Beaulieu Jazz Festival, televised by BBC, featured riots between trad jazz fans attracted by the likes of Acker Bilk and modernists watching Tubby Hayes and Ronnie Scott. Becomes known as The Battle of Beaulieu. The owner, Lord Montagu, says no more festivals. 10,000 people. Easter. Annual CND march from Aldermaston to London. 32,000 marchers met by 100,000 supporters in Trafalgar Square on April 3. Up to 900 local CND groups nationwide. Civil disobedience for peace spreads: 826 arrests at Whitehall in May; 1,314 arrests in Trafalgar Square, 351 at Holy Loch, in September; 860 arrests in national anti-bomb sit-downs in December. July. Final Beaulieu Jazz Festival—Montagu changes his mind. Extra police patrol Beaulieu village. Barbed wire and dogs. Further security is supplied by the Eastleigh Boys Boxing Club, hence violence, again between tradders and modernists heckling each other’s favourite performers. August. Richmond, Surrey. First National Jazz Festival, organised by Harold Pendleton of the National Jazz Federation. 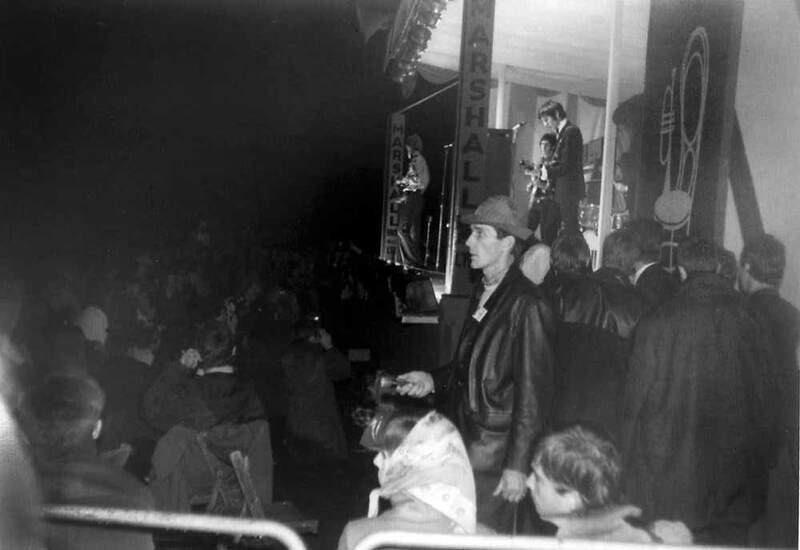 Pendleton had helped organise some of the Beaulieu Festivals, and also ran the Marquee Club in Soho, London, the birthplace of a number of subsequently famous groups including the Who and the Yard Birds. Trad jazz on the site of the annual Richmond Horse Show. Easter. Annual CND march from Aldermaston to London. According to reports in CND’s newspaper Sanity, this march was ‘the biggest of them all … 15,000 marchers had to be housed under canvas in Reading’, while 150,000 (a Peace News estimate) were at the final rally in Hyde Park. Addressed by Hiroshima survivors. January. Trad jazz all-nighter, from 10 p.m. on Friday until 7 a.m. Saturday morning, at Alexandra Palace, London. Gerorge Melly and Diz Disley introduce Acker Bilk, Kenny Ball, Ken Colyer, and other leading British trad bands. Easter. Annual CND march from Aldermaston to London, which included a sensational leaflet distributed on Good Friday by a mysterious group called ‘Spies for Peace’, distributing officially secret information about NATO exercises and government nuclear bunkers. July 26. Newport Folk Festival, Rhode Island. Bob Dylan, the new folk sensation. Richmond NJF Jazz Festival included the Rolling Stones on the bill for the first time. March 29. Clacton, Essex. 97 teenagers arrested in clashes between Mods and Rockers. Easter. One-day CND march in London. Some loss of initial energy, the optimism engendered by the signing of the Partial Test Ban Treaty in the summer of 1963 and the election of Harold Wilson’s Labour government in 1964‑as well as the rise of the Vietnam War as a campaign issue for activists from 1965, all contributed to an attenuation of the campaign. May. First pirate radio stations broadcast from offshore waters. Radio Caroline and Radio Atlanta. August. Richmond. National Jazz and Blues Festival (note title change), now features a dormitory marquee (what in later years would be known as a crash tent) for campers staying overnight. 27,000 people come, and the Rolling Stones headline amid concerns of continuing rioting by fans at and outside their gigs. April 19. Trafalgar Square rally at end of Aldermaston CND march witnesses 150,000 people, including many bearing anti-Vietnam War banners. June 11. Albert Hall, London. Poets of the World/Poets of our Time reading of Beat poets, led by Allen Ginsberg. Flower given to the audience (courtesy of the leftovers from the flower market at Covent Garden the night before) by face-painted women, and there is dope smoke, anti-Vietnam statements, folk music at the end. 7,000 people, who would become London’s underground constituency. Tom McGrath reviewed it in Peace News: ‘Even if the poetry reading had turned out to be a giant bore, the audience itself would have been an event’. July 26-27. Newport Folk Festival, Rhode Island. Dylan plays electric, and is booed by shocked audience. August 8. Richmond, for the last time National Jazz and Blues Festival. Jazz, but also the Rolling Stones, Yardbirds, Manfred Mann. As the official handout explained: ‘Something unheard of is happening at Richmond … for the first time … the pure jazz-men are outnumbered by beat and rhythm-and-blues groups who are no stranger to the hit parade’. 33,000 attend. January 4. Haight Ashbury, SF. First Acid Test at the Fillmore. August 1. Windsor, Berkshire. National Jazz and Blues Festival, which has moved from Richmond, where it was no longer welcome. (Councillors and local residents in Windsor try unsuccessfully to have it banned.) The Who incite audience participation in their destructive mode, their riot routine. Eric Clapton, Spencer Davis, the Small Faces. Camping on Windsor racecourse, and police act on the ‘immorality’ of young people of both sexes being allowed to sleep together in the overnight marquee. September (?). London. First Notting Hill Carnival: ‘a revival of the Notting Hill Annual Fayre that had been traditionally held in the area until it was stopped at the turn of the present century.’ Originates from organisers of an alternative neighbourhood community centre called the London Free School, and embraces local blacks and whites, and the alternative types living in the area. Abner Cohen: ‘The general cultural form that the carnival was to take was essentially English.… There was no suggestion that it would imitate a West Indian or any other foreign form of carnival’. October 15. International Times launch, Roundhouse, London. Soft Machine, Pink Floyd, slide shows and psychedelia Brit-style. ‘International Times First All-Night Rave’. ‘Bring Your Own Poison’ said the surprisingly unpsychedelic publicity. Sugar cubes handed out on entry. Mick Farren: ‘According to legend one in twenty was dosed with acid. Mine wasn’t.…Paul McCartney came by in an Arab suit.…Pink Floyd honked and howled and tweeted, clanked with great concentration. They were very loud with no musical form’. December. London. Opening of UFO club on Tottenham Court Road, with resident band Pink Floyd. Musical home of the London underground, described by Miles: ‘It was a club in the sense that most people knew each other, met there to …hatch out issues of IT, plans for Arts Labs, SOMA, and various schemes for turning the Thames yellow and removing all the fences in Notting Hill. The activity and energy was thicker than the incense.…’ Early audiences number 150, by July it is ten times that. January 14. The First Human Be-In, Golden Gate Park, San Francisco, with the Grateful Dead, and Jefferson Airplane. Advertised as a Gathering of the Tribe, and as ‘The First American Melah, A Baptism’. Hells Angels do the security, free food (‘It’s free because it’s yours’, said the Diggers), free LSD, all is peace and love. (On the strength of the Angels’ behaviour, Grateful Dead’s manager will recommend them two years later to organisers of Rolling Stones free concert—at Altamont.) ‘The first rock festival to capture the attention of the media’, says Harry Shapiro. 40,000 people. March 13. London School of Economics and Political Science (LSE). First British student occupation, lasting six day and involving over 2,000 students. June 5. Mount Tamalpais, California, near the redwood forests. The Fantasy Faire and Magic Mountain Music Festival. The first major medieval-style event, featuring the non-early music of the Doors, Country Joe, the Byrds, Jefferson Airplane, Smokey Robinson, Dionne Warwick. Festival-goers bussed to the site as nearest parking (remember this next time you’re grumbling about Glastonbury) is 25 miles away. Profits to go to a local black neighbourhood. Tickets $2. 15,000 people. June 16-18. Monterey International Pop Festival, California. Country Joe, Jefferson Airplane, Otis Redding (not long before his death), Jimi Hendrix, The Who, The Grateful Dead, Ravi Shankar, Buffalo Springfield (without Neil Young). Pete Townsend destroys his guitar, Hendrix sets his alight; the Mamas and the Papas close with ‘California’s dreaming’. D.A. Pennebaker’s film of the event, Monterey Pop. Until Woodstock two years later this is the festival by which others are judged partly because many of the musicians were involved in organising it, financing it. 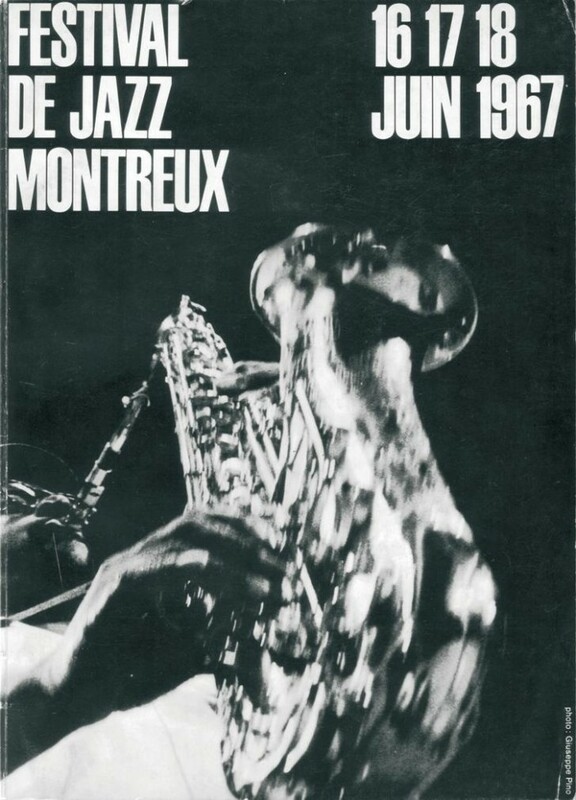 Montreux Jazz Festival 1967 poster. Source: Voices of East Anglia. 16-18 June: First Montreux International Jazz Festival, founded and directed by Claude Nobs; artists included the Björn Johansens Sekstett, Les Tin Pan Stompers, the Charles Lloyd Quartet, and the Babs Robert Quartet. The first festival lasted three days but in later years, lasts for 16 or 17 days in July and in some years it has exceeded 20 days). Original located in Montreux Casino (to c.1988), later the Stravinsky Auditorium (3000 cap), and Miles Davis Hall (2000 cap); in 1999 the total, including the “Off-Festival,” was 200,000. From 1980, associated with the Montreux–Detroit Kool Jazz Festival; for database of artists performing each year see Montreux international jazz festival. July 15-29. London. International Congress of Dialectics of Liberation is held at the Roundhouse. The counterculture’s intellectual wing hears Herbert Marcuse, R.D. Laing, Stokely Carmichael, Ernest Mandel at ‘a unique gathering to demystify human violence in all its forms’. Windsor. NJF National Jazz and Blues Festival, again at Windsor racecourse. In Tomorrow’s People, Jeremy Sandford describes how the old trad festival has been reinvented by the hippies: ‘This was the year of flower power. “Hippies completely replaced the familiar beatniks of yesteryear. Beads and bells ousted duffle coats and cider jugs”‘. Donovan, the Nice, Ten Years After, the Small Faces, while Pink Floyd don’t get it together. August 26-28. 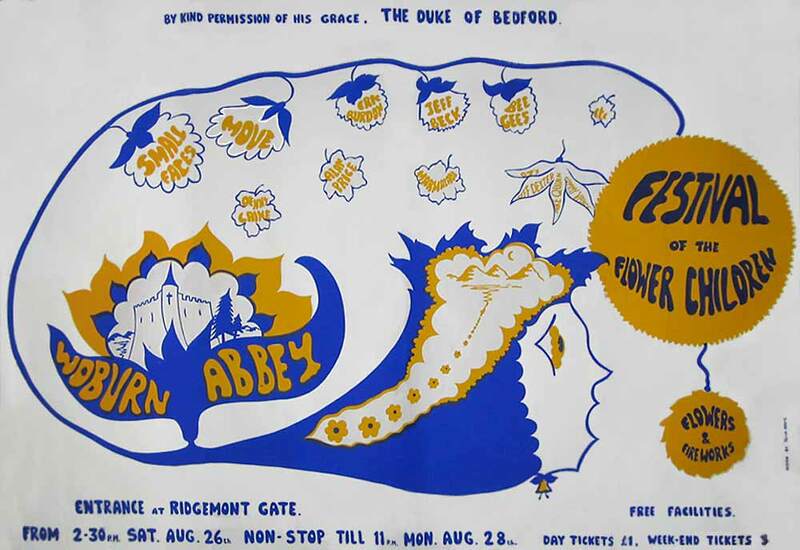 Festival of the Flower Children, Woburn Abbey. Organised by the Duke of Bedford. Marmalade, the Bee Gees, firework displays every night. Free flowers and sparklers. September. London. Second Notting Hill ‘street carnival and the international song and dance festival’, a multicultural event, including local black and white residents, and about 2,000 hippies. Highlighting the social context and impetus of the event, a performance called ‘England This England’ was described by local Kensington News as a ‘musical parody of the housing problem’. October. UFO club closes. Middle Earth, a smaller club for freaks, runs for just over a year. October-November: London Expo – festival started in 1967 and went on until possibly 1970, although the title changed annually to reflect the date. It was organised by Jack Higgins of the Harold Davison Organization and went on for seven or eight days with concerts in the Royal Festival Hall and Hammersmith Odeon to audiences of 38,000. The main genres played were dixieland, swing, bop, free jazz, and blues and featured Dave Brubeck Quartet, the Max Roach Quintet, Bill Coleman, Budd Johnson, Ben Webster, and the Bill Evans Trio. The festival is associated with George Wein, organiser of the New Orleans Jazz Fest. March 17. The Battle of Grosvenor Square, London. Students and revolutionaries march through London and protest outside the American Embassy against the Vietnam War. Nigel Fountain remembers the drama: ‘It was the antithesis of the CND marches.… [T]he issue wasn’t peace, it was war: victorious war for Vietnam’s National Liberation Front, and class war on the bourgeoisie’. Paris, May. Following student activism over the past few years in the US, across Europe, Japan, connected with anti-Vietnam War protest, spontaneous rioting around the Sorbonne. A general strike across the entire country, as workers and students agitate in solidarity with each other. June. Appleby Horse Fair, threatened with closure, is saved by gypsy activists. August 31, the ‘GREAT South Coast Bank holiday POP FESTIVITY’. 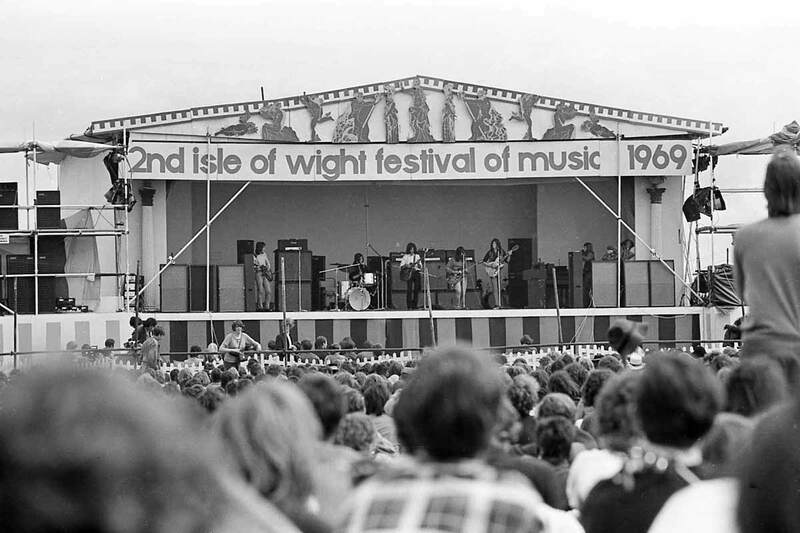 First Isle of Wight Festival, at Godshill, founded to raise money for a municipal swimming pool for residents. John Peel introduced Tyrannosaurus Rex, the Move, Fairport Convention, and, to supply some transatlantic kudos, Jefferson Airplane (who, a few days later, played Parliament Hill Fields). Attendance 10,000. September (?). London. Notting Hill ‘Carnival of the Poor’. With cunning ingenuity, the early Autumn torrential rain was passed off as a ‘tropical downpour’ in the sympathetic local press. June. Hyde Park, London. Free concert to launch Blind Faith, a, uh, supergroup featuring Eric Clapton and other 60s luminaries. 100,000 people. Group so super they disbanded a few months later. June 25. Bath Blues Festival. First outdoors gig by Led Zeppelin, fourth on the bill behind Fleetwood Mac, John Mayall, Ten Years After. The stage manager said ‘there was so much noise that I thought we had a riot going on. I rushed out of the back stage area to find it was nothing more sinister than the climax of Zeppelin’s set’. 30,000 people. July 3-6. Newport Jazz Festival, Rhode Island. The 16th annual festival, now with heavy rock for the first time. Jethro Tull, John Mayall, Ten Years After, and, on the final night, in spite of pleas from the authorities that they shouldn’t play, ‘in the interests of public safety’, Led Zeppelin‑as well as more acceptable Newport fare of James Brown, BB King. 80,000 attend. July 5. Hyde Park, London. A free festival thrown by the Rolling Stones (following the success of Blind Faith there last month). Film released, The Stones in the Park. 2,000 people camp the night before, 250,000 people attend on the day. Jagger reads Shelley poem in memory of Brian Jones, former Stones guitarist who had died two days earlier. A sign of eco-consciousness some Glastonians would be proud of: at the end, a free Stones record is given in exchange for each full bag of rubbish. August 15-17. Woodstock Music and Arts Fair, New York State. Advertised as ‘Three days of peace and music’ on 600 acres of dairy farmland near the town of Bethel. A sign in the town said: ‘Stop Max’s Hippie Music Festival. No 150,000 Hippies Here. Buy No Milk’. Hendrix, Jon Baez, Janis Joplin, Joe Cocker, Crosby Stills and Nash, the Who, and 400,000 people (all of who seemed to know that Bob Dylan was living a semi-reclusive life nearby). Also three deaths, two births. Half way through someone said let it be free. Michael Wadleigh’s film is influential in maintaining the idealism and actuality of festival culture internationally. August 29-31. Second Isle of Wight Festival, Woodside Bay, near Ryde. Bob Dylan, Bonzo Dog Doo-Dah Band, the Nice, the Moody Blues, Indo-Jazz Fusions, Julie Felix, Richie Havens. A state of the art 2,000 watt PA system carries the music to Parkhurst prisoners and Quarry monastery monks on the island. Anything between 80,000-200,000 people attend (and only 22 drug arrests). September 30. Toronto Peace Festival, Canada. John Lennon and Plastic Ono Band including Eric Clapton and Yoko Ono, plus rock ‘n’ roll stars Little Richard, Chuck Berry, Gene Vincent. December 6. Sears Point Raceway, Altamont, California. A free festival with stage security courtesy of Hells Angels chapter, who kill one festival goer, a young black man called Meredith Hunter, at the festival with his white girlfriend. Three other deaths: two in their sleeping bags by a hit and run driver, and one drowned in a canal on a bad trip. Originally planned as a free open-air show by the Rolling Stones, it extends into a whole day concert, including Jefferson Airplane, Santana, CSN&Y. If Woodstock is frequently cited as the utopia of the 1960s, Altamont is its nightmare, at its end, its end. Three days later Charles Manson is indicted for the August 1969 murders of Sharon Tate and others. The Maysles Brothers’ film of the event, Gimme Shelter, released in 1970. 300,000 people.